Pictured from left: JM Assistant Principal Geno Polsinelli, Conner Blatt, Trixie Calissie and Worthy Warden of the Knights of Columbus Moundsville Council 1907 Lewis Richmond. 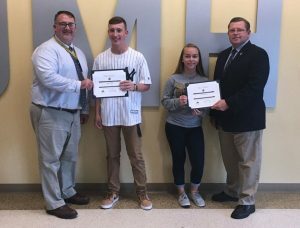 The Knights of Columbus-John Marshall High School Students of the Month for September are freshmen Conner Blatt and Trixie Calissie. Trixie feels delighted to be Student of the Month. “It’s special to me because I haven’t been here very long and I’m glad that people notice I can do well. My great grandfather, before he passed, was a big part of Knights of Columbus. So I know he would be really proud of me,” said Trixie.